This has been a fun and adventurous month in the Kitchen Wife household. I've been in a bit of a food rut recently, so I decided to do something drastic, and make March a meatless month. That's right, I said MEATLESS!!! Now, so as not to put my King of Carnivore husband into a total state of shock, I decided we I would allow egg and cheese, but other than that no animal products would be consumed. It's been a challenge, but a lot of fun too. I've been able to work with seasonings and ingredients that I wouldn't normally try. Take this Easy Tofu Scramble Recipe for example. Tofu is usually packed in some form of liquid, which makes it very wet. No one wants mushy tofu, so to begin you will want to wrap the extra-firm tofu in a paper towel and place something heavy on top of it to press out the excess liquid. This will take about 30 minutes. Once the excess liquid has been pressed out, place it in a bowl and break it up using a fork or potato masher. Now add the coconut oil to a non-stick frying pan and allow it to get HOT over a medium/high flame. When the pan is hot add the scrambled tofu and let brown for 2-3 minutes. While the tofu is browning you can combine the seasonings. Remember how I told you that this has given me the opportunity to work with new seasonings? Well, turmeric and nutritional yeast are two things that I haven't used in the past. 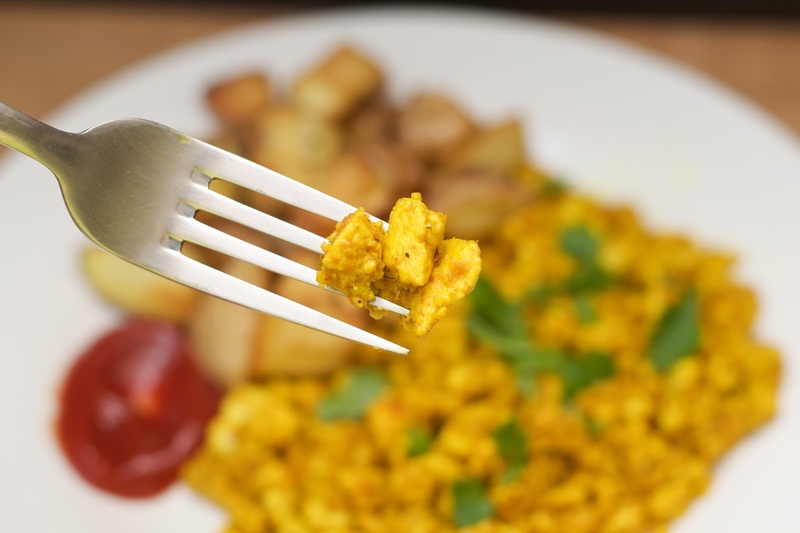 Turmeric will gives the tofu that lovey golden color we are accustomed to seeing in our scrambled eggs, and the nutritional yeast gives it a creamy, almost cheese-like flavor that you would get from the yolk. I will say that I had a difficult time finding nutritional yeast so I ordered it (HERE). However, I have used to to make mac and cheese, alfredo sauce, on spaghetti in place of parmesan, so many uses. Add the seasoning to the browned tofu in the pan. Stir everything around until all of the tofu is coated and cook for another 2-3 minutes. 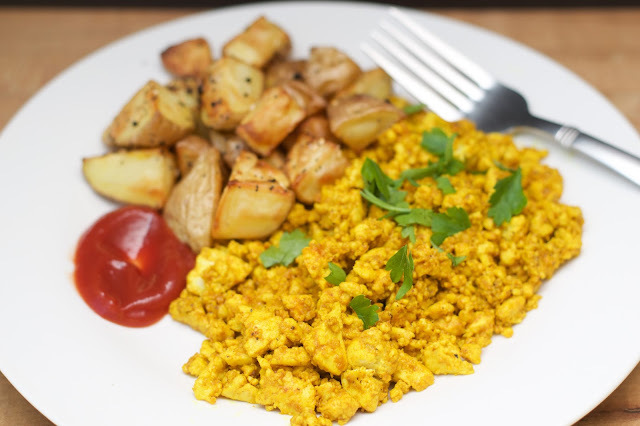 Look at this beautiful, golden, scrambled tofu. It's light, fluffy, and FULL of flavor! I served mine with some oven-roasted potatoes and it was absolutely delicious. Look at that! It looks just like the real thing. I know that tofu gets a bad wrap, but I promise you that you cannot tell the difference. 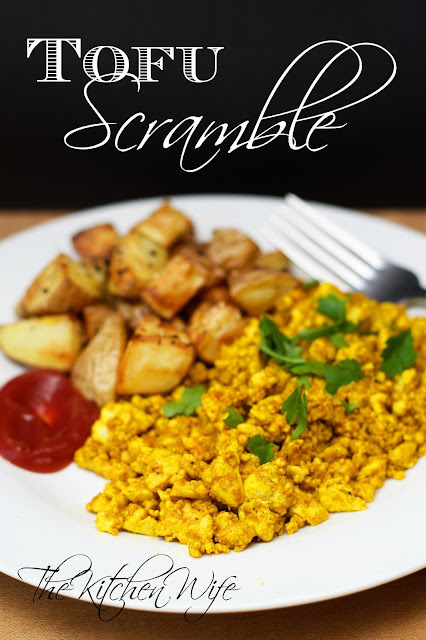 So if you're looking for a plant-based alternative to your scrambled eggs in the morning, give this Easy Tofu Scramble a try. Wrap the extra-firm tofu in a paper towel and place something heavy on top of it to press the excess liquid out. Do this for about 30 minutes. Place the pressed tofu in a bowl and break it up using a fork or a potato masher. Place a frying pan over medium/high heat and add the coconut oil. Allow the pan to get HOT. Add the scrambled tofu to the pan and brown for 2-3 minutes. Add the nutritional yeast, turmeric, salt, and pepper to the pan and stir everything together until all the tofu is well coated.